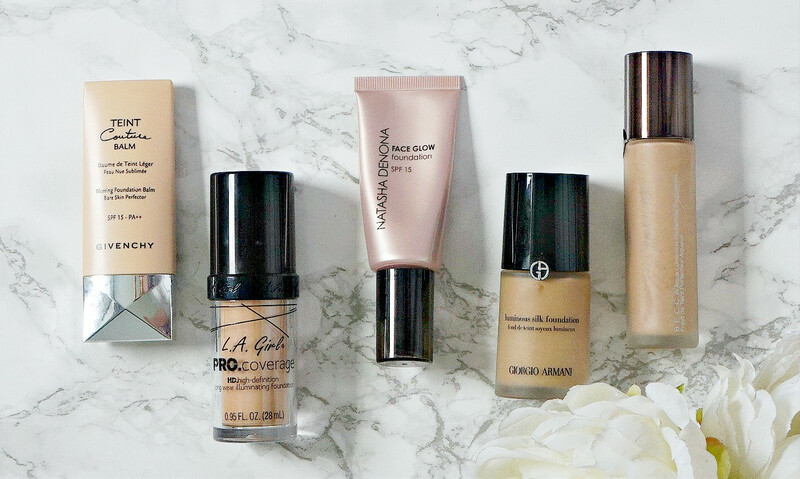 All skin types face problems when it comes to finding a foundation that works. Oily skin faces the battle of foundation becoming shiny and not lasting longer than a few hours, for those with combination skin, it can be difficult to find a foundation that is even all over and lasts in the t-zone and for dry skin, like mine, it can be difficult to find a foundation that doesn't age the skin, cling to particularly dry patches and cake. I have spent many years (and a lot of money) trying lots of foundations and have compiled a list of five that I find work really well on my dry skin, which I want to share with you today. I tend to favour a dewy finish but some of these are more satin or luminous than dewy but if you generally like the "lit from within" look, you will like all of these foundations. Obviously, skincare is very important no matter what your skin type and all bases will apply better to exfoliated, moisturised and primed skin. Givenchy Teint Couture Blurring Foundation Balm: This foundation is perfect for anyone who has extremely dry or irritated skin because the balm texture means that it is extremely comfortable to wear. It offers medium coverage and the blurring properties diffuse the appearance of my pores in the cheek area, as well as my fine lines. It feels very lightweight on the skin and lasts a good 7/8 hours on my skin. I find that it is best applied using my fingers. It contains SPF 15. L.A. Girl PRO Coverage HD High Definition Long Wear Illuminating Foundation: This is the best budget foundation that I've tried. It gives medium-full coverage but in a natural, non-mask like way. It doesn't feel heavy on the skin and the finish is quite luminous, without looking greasy. My skin looks fresh, hydrated and youthful when I wear this foundation and I would recommend it to anybody who has dry skin but wants medium-full coverage. Natasha Denona Face Glow Foundation: This foundation is definitely most suited to those who like a glowy finish with medium coverage. It has a gel/cream texture that is so lightweight that it doesn't feel like I'm wearing any foundation at all. This foundation makes skin look smooth, healthy and glowing, banishing any signs of fatigue and it doesn't settle into fine lines, highlight pores or make the skin look greasy. It contains SPF 15. Giorgio Armani Luminous Silk Foundation: My most repurchased foundation! This base doesn't feel heavy on the skin (a running theme in this post as I hate that feeling! ), yet it gives medium-full coverage. It glides over pores and fine lines without settling into any crevices. The finish is neither matte nor dewy - a luminous satin would be the best description. Despite being oil-free, it works really well on my dry skin. I use very little concealer when I use this foundation as it makes the skin look pretty flawless and it is very long-lasting, making it perfect for long days and late nights. It doesn't contain any SPF, which is perfect for any occasion where flash photography might occur. Becca Aqua Luminous Perfecting Foundation: This foundation really lives up to its name because it feels as light as water when worn, it has a luminous finish and despite being so lightweight, it gives medium coverage. This foundation makes the skin look even and healthy, glowy but not greasy and it blurs the appearance of fine lines. My only negative is the pipette dispenser - I much prefer a pump! If you have dry skin, have you used any of these foundations or do you have any recommendations? I'd love to hear!